A healthy and delicious meal of steamed fish and vegetables. Equipment and preparation: for this recipe you will need a two-tier bamboo steamer. Roll up each of the 12 plaice fillets and set aside. Fry the bacon rashers in a dry pan until crisp. Drain on kitchen paper. For the pea purée, add the butter to the pan used to cooked the bacon. Heat until melted, then add the peas, parsley, 50ml/2fl oz water and double cream. Season to taste with salt and pepper. Warm through on a gentle heat and then transfer to a blender and pulse until you have a very smooth purée. Taste to check the seasoning and add more butter if desired. Put the new potatoes into the lower basket of a two-tier bamboo steamer set over a pan of boiling water. Steam for seven minutes. Meanwhile, cut out a circle of greaseproof paper to line the top basket of the bamboo steamer. Grease the paper with a little butter and line the basket of the bamboo steamer with it. Season the rolls of plaice with salt and pepper and place them on the paper. When the potatoes have been cooking for seven minutes, add to them the asparagus and peas in their pods and steam for a further 2-3 minutes or until tender. Place the top basket containing the plaice on top of the vegetables and cook for 2-3 minutes, or until cooked through (take care not to overcook them). 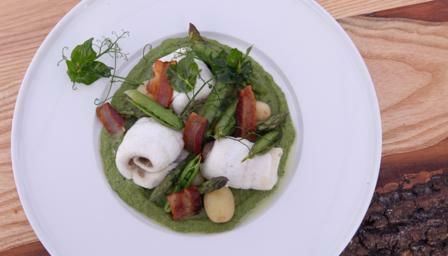 To serve, toss the pea shoots in a little rapeseed oil and divide the plaice fillets between four serving plates. Add some pea purée, crisp bacon and steamed vegetables. Garnish with the dressed pea shoots.